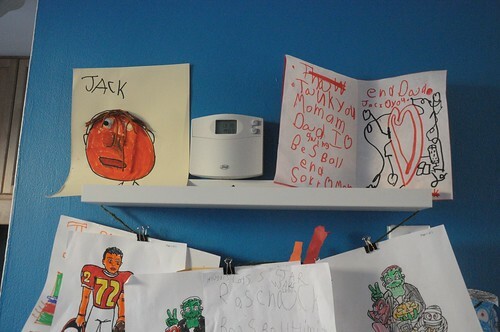 I’ve recently chatted with several parents about how they display their kids’ art. 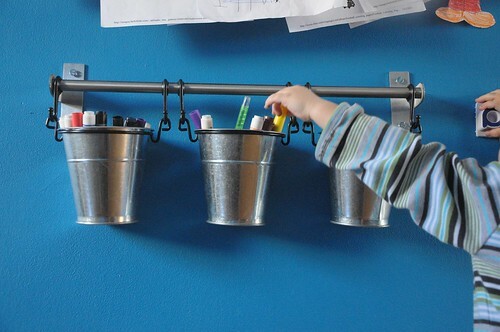 Which ones do you keep, which ones do you sneak in the trash so your kids don’t see, and how do you encourage creativity in a small space without your house feeling cluttered or looking like a daycare center? Here are few ideas. I attached an IKEA RIBBA ledge shelf on the upper part of the wall. 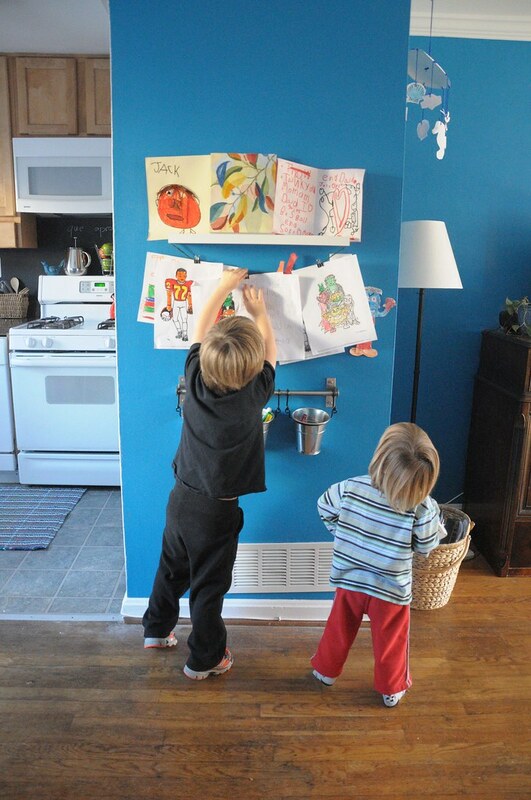 This serves double duty — displays art projects and hides the awkward thermostat. The pictures only lean alongside the thermostat and do not block airflow to the register. 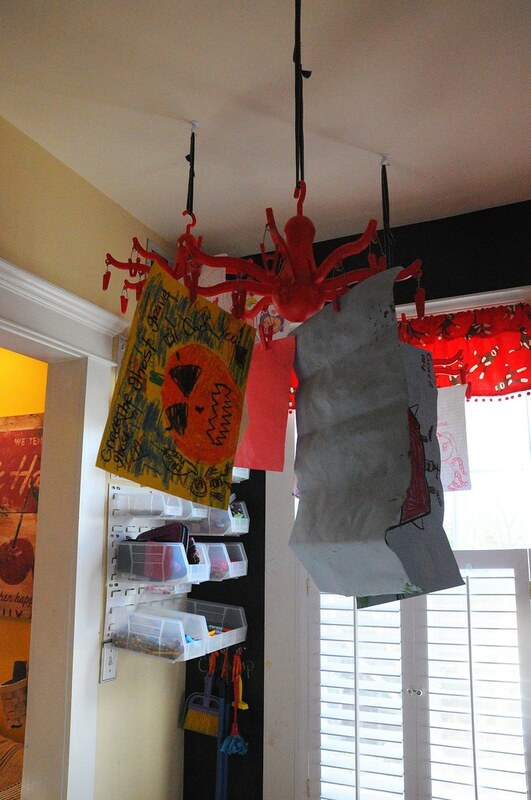 A string hanging below the shelf holds additional projects, attached with small binder clips. This rod with hooked cannisters (also from IKEA) holds markers, crayons, and glue sticks. Need some markers? Just unhook the can and take to the table. It’s all within reach of the little ones’ hands. We keep the art display seasonal. After pieces have been up for a while, we decide which ones we want to keep and which ones we want to save. The saved pieces go in a storage box in the basement. 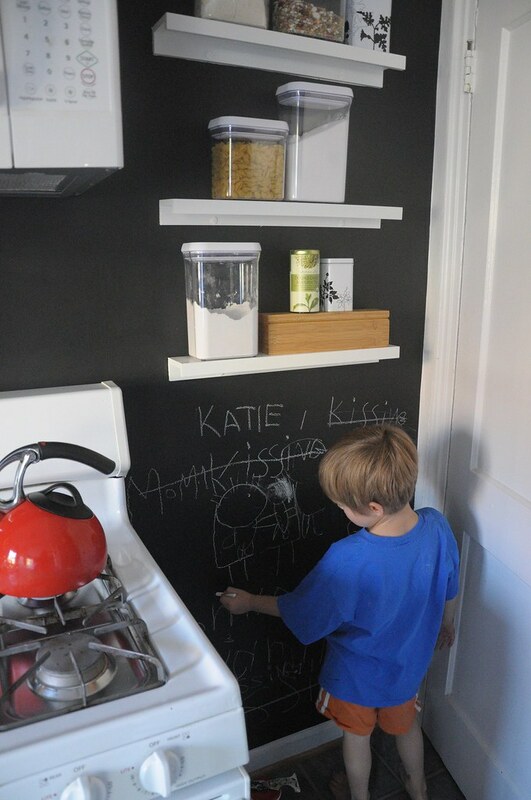 Second, as mentioned in our chalkboard paint post, I painted the backsplash and wall in the kitchen with chalkboard paint. The kids can doodle all they want in their own little corner. 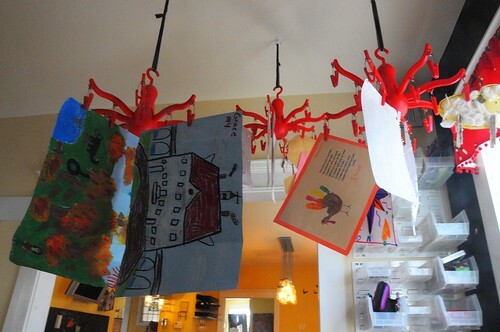 Another local resident, Christi, hung these funky hooks from IKEA from her ceiling to display her daughters’ art. Using the ceiling is such a smart idea and makes the room so much more interesting! She turned her front room into a play room for her three girls. There’s even an entire wall covered with chalkboard paint and built-in bookcases stocked with baskets for toys and art supplies. 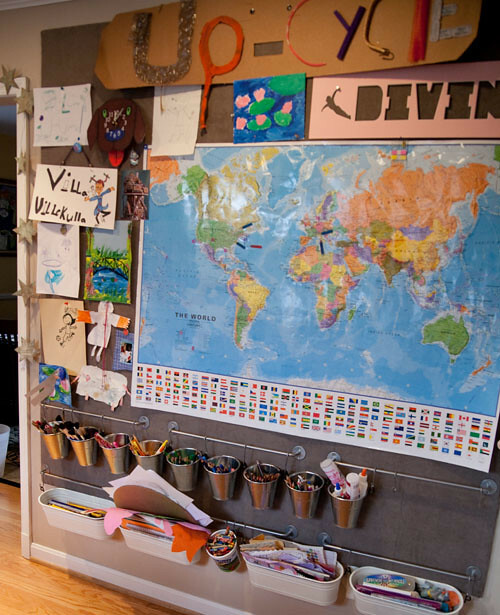 And finally, in this post featuring ideas for displaying children’s art, Leslie shares how she had her daughters’ art box-mounted by Del Ray Picture Framing on Mt. Vernon Ave. 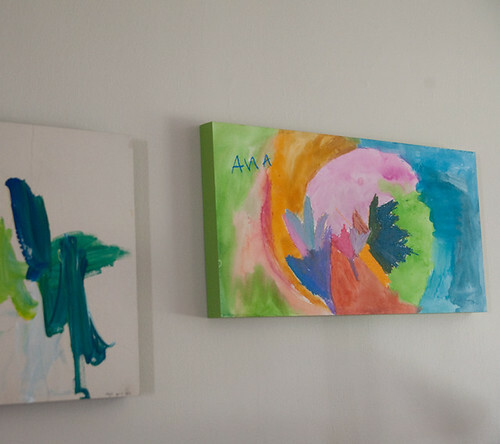 So we want to know — how do you display your kids’ art? How do you keep art supplies organized in a small space? I use these fabulous storage frames. They hold about 50 pieces of art. I dont have to decide what to save or trash until they get full! Those are great — thanks for the tip! I was inspired by this article to create an art space for my 3yo in our living room. I used a hanging shoe organizer for her supplies. It would work well if it was installed correctly.